We don’t really have a good photo of what this space looked like before we started work on it. 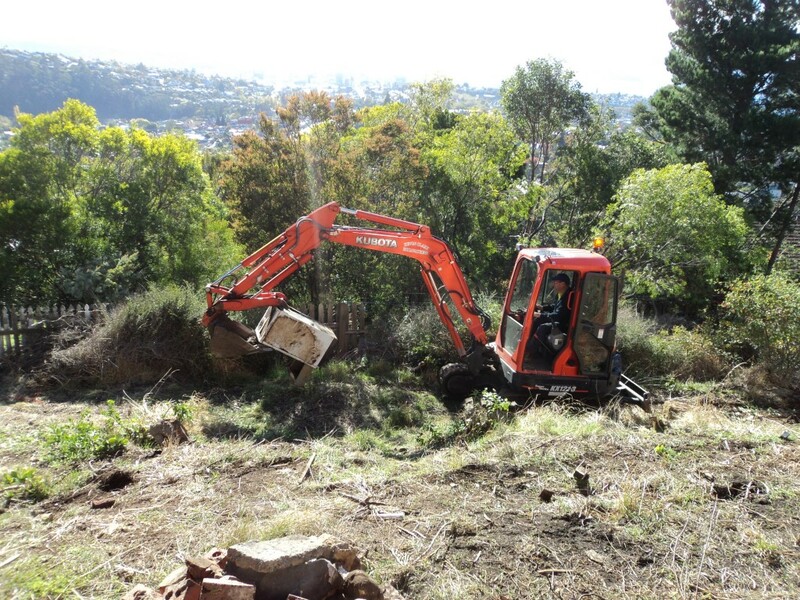 But here’s a photo of the excavator moving rubbish (the previous owner dumped there) when we were in the early stages of getting things started. 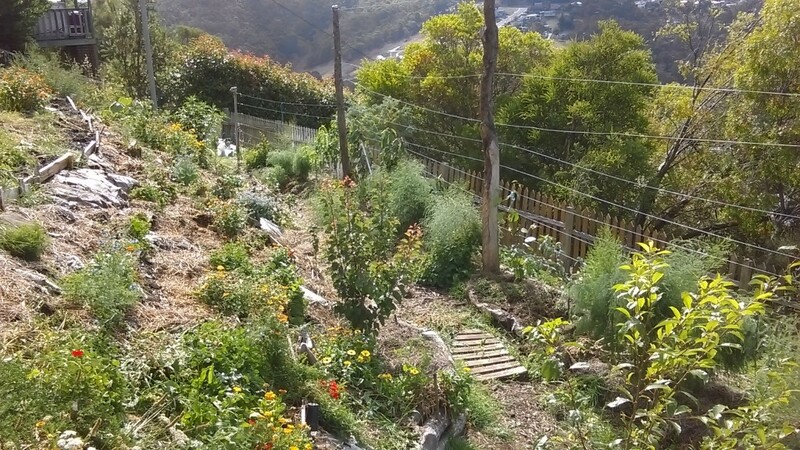 One of the first things we did when we stablised the main steep bank was plant it out with lots of vigorous seeds including white clover, calendula, borage, corn flowers and nasturtiums – plus we had volunteers such as dock and plantain spring up everywhere to ‘hold’ the bank together. We’re now enjoying the “instant” beauty of these plants while we wait for all the native ground covers and small bushes to grow. They’re so small you can’t see them in this photo, but they’re there! The central path has been dug out on contour, filled with these fancy things which look like milk crates (designed for grey water systems), wrapped in geo fabric and back filled with woodchips. Most of the time it’s an empty space, over designed to be able to cope with crazy floods (just in case) so there’s no risk of it flooding or causing water logging with the plant’s roots. 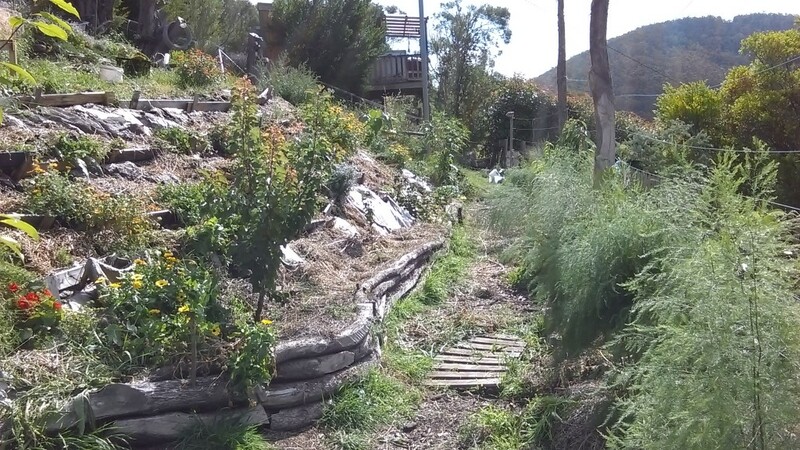 Eventually we’ll be directing greywater from our house (kitchen/bathroom water) into this absorption trench, currently this is where the overflow from our rain tank (which is so big it never over flows) is directed. 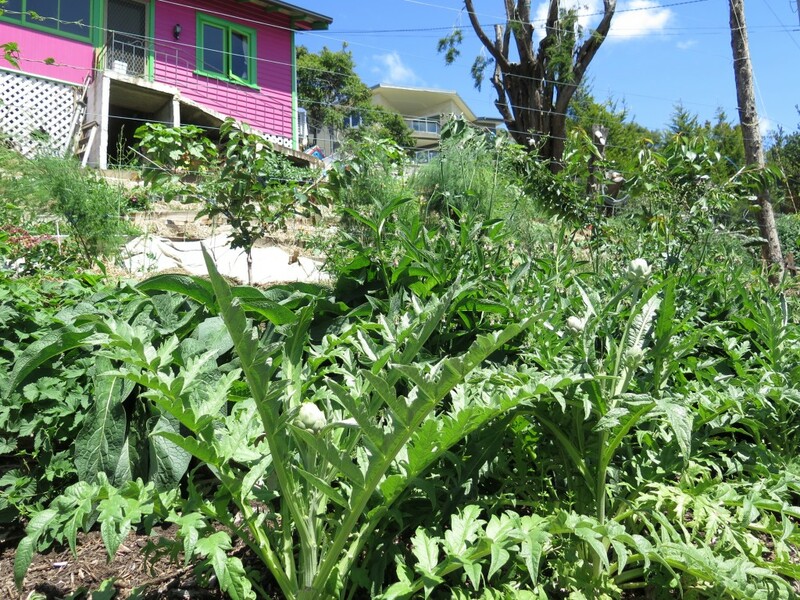 Globe artichokes and comfrey have been planted on the downhill side of the slope to capture excess water runoff (they love moist, fertile spaces) and to stablise the slope.The comfrey also gets slashed back a couple of times every summer and used as mulch for the fruit trees. 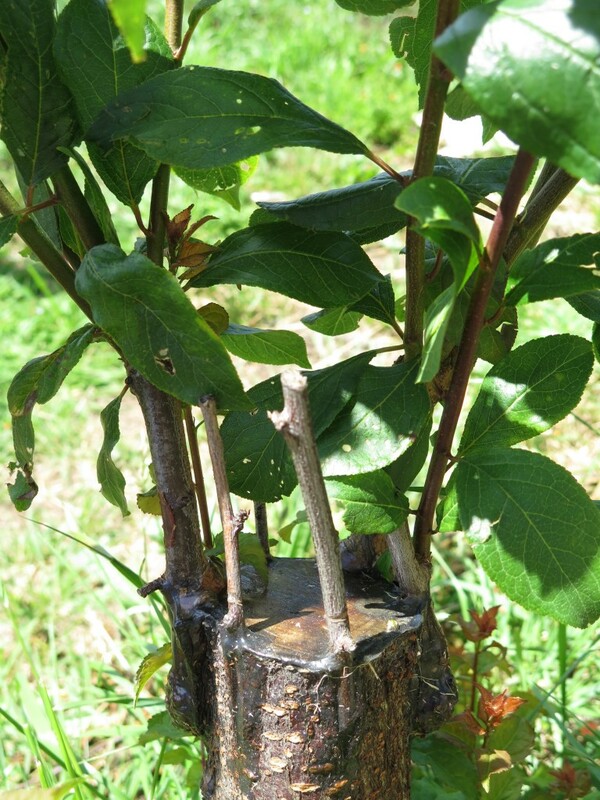 We cut down the existing wild plum tree (which was all pip and no flesh) and did a bark graft with a super awesome plum variety. It’s looking pretty exciting and promising! We also planted hops which are a perennial crop that grow super tall into Summer and get cut down every Autumn. 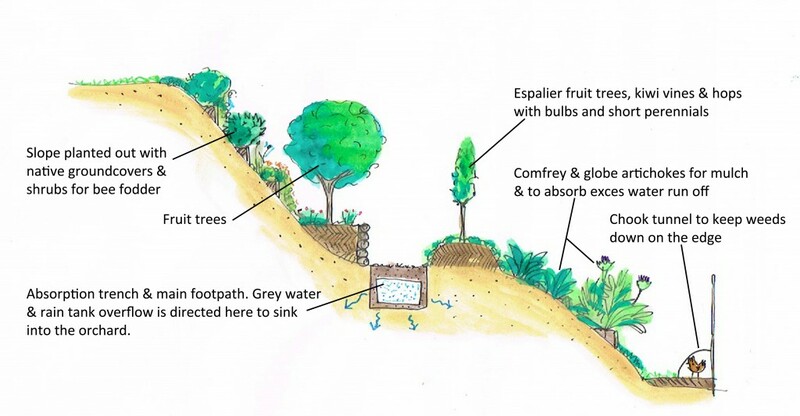 The idea is that they can be trained along the same framework as the fruit trees and kiwis, just at a different height, so they can all live harmoniously in a compact space. 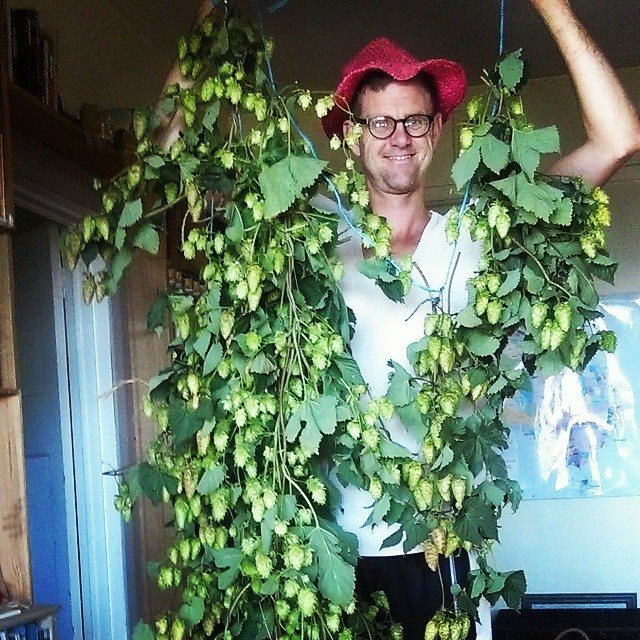 Anton and some of our hops – our first harvest from our young orchard space. 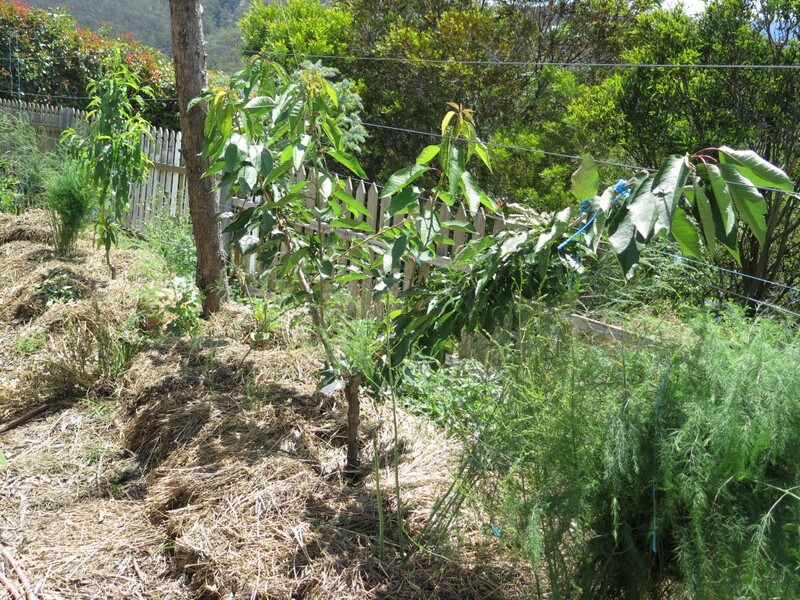 In the photo below, you can see a fluffy plant on the bottom right, along the line of espaliered fruit trees – this is asparagus, which has gotta go. 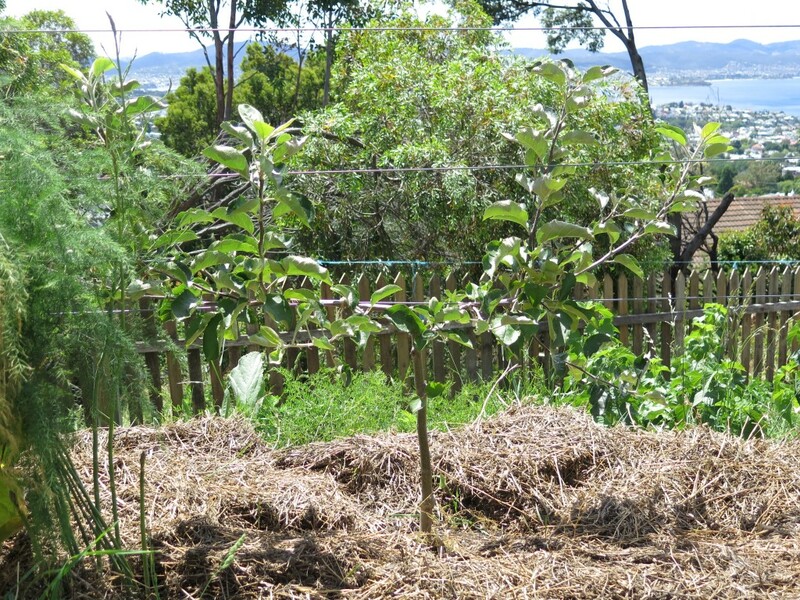 It’s simply too big and dominating for our super compact orchard and will compete with our fruit trees for nutrients and space above and below the ground. I had a moment of false enthusiasm when I planted it so will be transplanting it into another space this coming Winter. 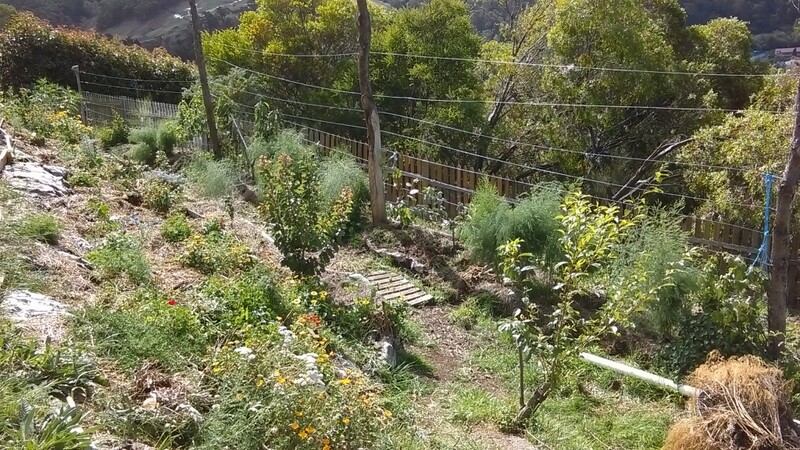 In a larger orchard, asparagus can be planted easily, we’re just a bit space poor on our crazy steep slope. 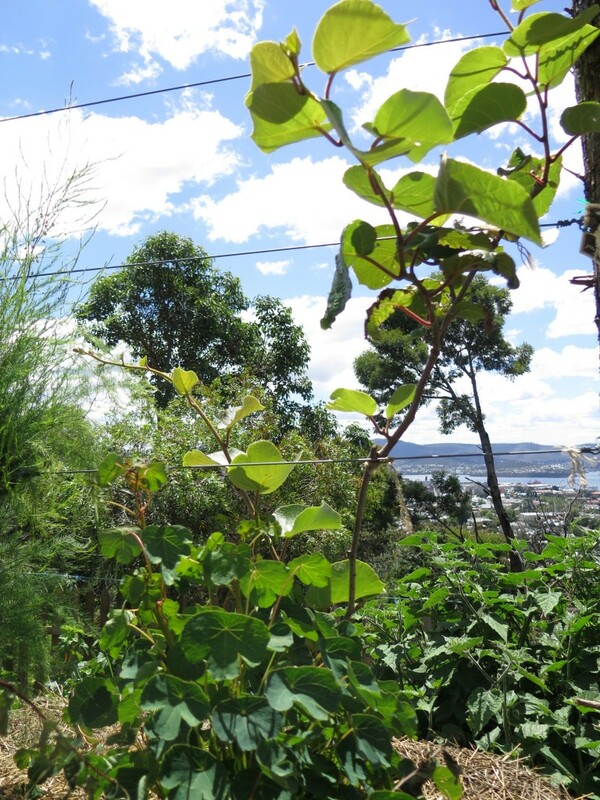 One day in the not too far future the empty lines of wire you can see will be covered in kiwi vines and mature fruit trees. It will be pretty spunky. But we reckon it looks pretty spunky right now compared to the massively weedy mess it was when we started – think large sprawling cotoneasters and rosehips with thorns that could rip your eyes out. 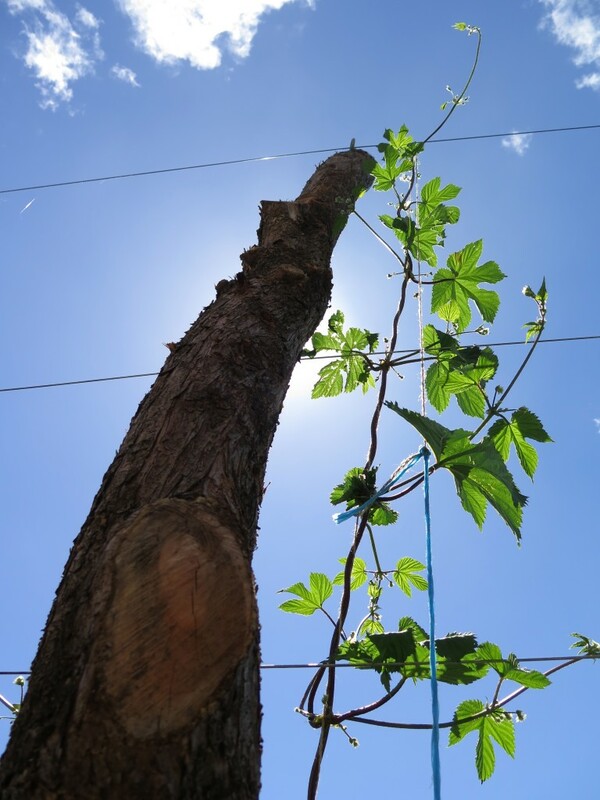 We kinda already feel like we’ve ‘made it’, imagine how we’ll feel once we’re hanging out in there, enjoying some homebrew and eating fruit straight off the tree… Good, really good. Gosh, it’s so great to see your orchard progress! So much inspiration, thanks for sharing! Thank Joel! It’s been a bit of a slog, so it’s great to see it coming together! Hi Hannah. Am wondering where you got your “milk crate” drainage things? Just came across you site. It all looks great.